eBay have launched lots of WOW deals and this one has blown our socks off. Lots of you have been screaming out for affordable Play Kitchens and here we have one for just £22.99. It's sold from eBay Seller: Pink and Blue Gifts and delivery is FREE of charge. Oh, and you get lots and lots of accessories with it like pots, pans and play food. The 69 Piece Large Play Kitchen Set is a big plastic play station with lots of features and a mass amount of accessories. For under £23 delivered, you'll struggle to get a Play Kitchen with as much going for it. The hob is electronic and the cooker controls click when turned. You will not need to buy any extras to go with this Play Kitchen as it has absolutely everything that your little one could possible want or need. 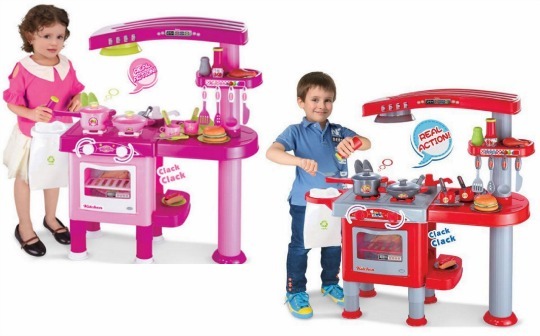 This Play Kitchen Set is suitable for children aged three years old and above. Delivery is FREE but should home delivery be inconvenient, you can choose to collect it from your local Argos store.